The Union`s new leadership was presented, and the Mayor of the Capital City Mr. Slavoljub Stijepovic in an interview pointed out the development perspectives of Podgorica. Special attention is paid to the development and management of projects and the Network of Municipal Project Managers. The Union participation in the Council for Improvement of the Business Environment, Regulatory and Structural Reforms, then Best Practice in Local Government 2014, study visits to Brussels within the LAF Program, a workshop on “Spatial Development and Construction of Buildings in the Local Self-Government” were presented. 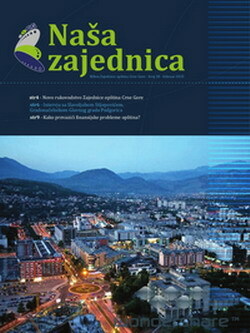 A Union`s request to the Government of of Montenegro to ensure respect for the right of municipalities to declare in the drafting of laws and other regulations which are of importance for the local government functioning is presented. The current events and news in the municipalities were also presented.